Catholic News World : Faith at Fifa - World Cup Famous Players Display Faith without Fear - SHARE! Faith at Fifa - World Cup Famous Players Display Faith without Fear - SHARE! The World Cup in Brazil 2014 has opened a gateway to Christian expression. It must be said, however, that there are many shortcomings to the integration of this sport into the country in terms of exploitation of the poor and trafficking. Many famous World Cup players are openly displaying their faith on and off the field. Here are an example of some of the many players who express their love for Jesus. OPENLY SHARE YOUR FAITH SHARE THIS ARTICLE ON YOUR WALL OR BY EMAIL! U.S. World Cup player Clint Dempsey said in interview with Sports Spectrum. "Today, I pray for strength to walk the road before me," Dempsey said. "I play to the best of my abilities and am thankful for the many opportunities and amazing success He has given me. Through it all, I want to do right, not make mistakes, and live a life that is pleasing to Him." Dempsey is from a Catholic family who went to church every Sunday. Ricky Kaká, Born in Brazil, his real name is Ricardo Izecson dos Santos Leite. Ricky, is known as Kaká. He led Brazil to the 2002 World Cup championship, he wore his “I belong to Jesus” t-shirt for all interviews. He frequently drops to his knees and points to heaven to thank God.Time Magazine named him one of the top 100 Most Influential People in the world. Tim Howard - Goalkeeper, USA Howard is a evangelical Christian and has appeared in many Christian films. David Luiz - Brazil - He used to have a van with a 'Christ is Life' sticker on it, David also laid hands in prayer on fellow player Fernando Torres live on TV. Thiago Silva - Brazil - Thiago is a Christian and believes his recovery from tuberculosis was due to God's intervention. He said, "I almost died from TB in Russia several years ago. God saved me." Wesley Sneijder - Holland Wesley was baptized a Catholic and Catholic team-mate Javier Zanetti. 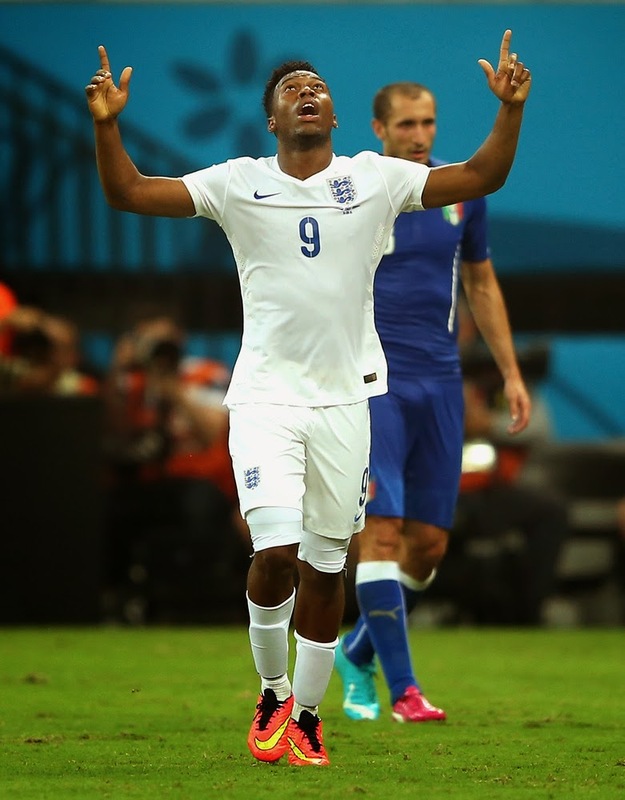 Raheem Sterling - England - Raheem tweets Bible passages and prays before games. Park Chu-Young - Korea Park said,"The first and main reason why I play is to evangelize people." Daniel Sturridge - England - (pictured above) Daniel is very openly Christian who tweeted, "Not ashamed to tell the world. I'm blessed and I thank God for all that has come my way. Giving God the glory always." Shola Ameobi - Nigeria - Shola and Sammy are brothers and openly Christian. Shola told The Guardian: "It's hard for any Christian in a secular world not to conform to the pressures to do things other people are doing." Cristiano Ronaldo - Portugal - Cristiano is considered one of the the world's best players. Ronaldo is a Catholic, and he has said that faith is "one of his priorities.